Serving San Juan County for more than 40 years! We regret that we are unable to vaccinate or perform spay/neuter surgeries on wolves, wolf-hybrids, coyotes, or coyote-hybrids at this time. Thank you for your understanding. If you would like to donate to our spay/neuter, TNR, or vaccination programs, use the donate button below. Thank You! 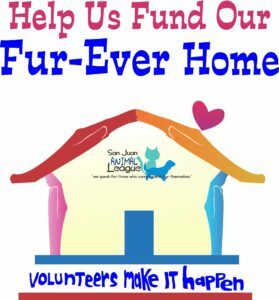 Why does San Juan Animal League advocate for spay/ neuter of pets? It’s hard to fathom but just one unaltered female dog and her offspring can produce 67,000 puppies in only six years. In seven years, one unaltered female cat and her offspring can produce an incredible 370,000 kittens. Watch the animated clip below. Email us at SJALVolunteer@gmail.com to get connected to our volunteer program. Join SJAL today! Use the donate button below. If you would like to donate to our building fund, use the donate button below. Thanks!